The Autumn Lawn Renovation programme took place on October 13th. Thanks to all the club members who helped. Although causing a short period of disruption to play, this work is essential to improve the health of the grass. It also enables us to do some general ground levelling and repairs over and above the regular maintenance sessions. This sort of work would be unaffordable for a club of our size if we had to use external contractors, so we are very dependant on our own efforts. National Successes for Nick Mounfield and a win at home too. Nick Mounfield has achieved some remarkable results in recent weeks. He has shot up the rankings to UK No 27 and is now officially the fastest improver in the WORLD! ‘Eights Week’ early in September each year is a premier event in the Croquet Association calendar. Top AC players are invited to play in one of five major tournaments, each person playing seven others twice each over a four-day period. Nick competed at Ramsgate in the second-ranking event, won eleven of his fourteen matches, and won the Chairman’s Salver. He also won the Advanced weekend at Letchworth 18/19th August, winning all five of his matches . What a fantastic summer! Our 25th Anniversary Summer Party was a great success. There was even time to play some Crazy Croquet! Congratulations to Robert Staddon who has qualified for the National Finals in the All England GC Competition. Congratulations to John Skingsley who has won two CA GC Tournaments at Letchworth this summer. John Skingsley and Robert Staddon were winners of CA GC Handicap Doubles 21st May. John also won the Singles event on 16th June. The Ken Wheeler Shield tournament is an annual, one-day, level-play GC competition (inaugurated in 2011) among six county teams in East Anglia. 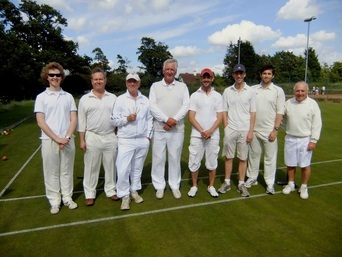 The inaugural 2011 event was won by the Herts team of Nick Mounfield (captain), Duncan Hector and Ian Mantle, and Nick Archer of Watford. This year's event was held on Saturday 9 June 2012 (a windy but mostly dry day) on the five, fine lawns at Hunstanton. 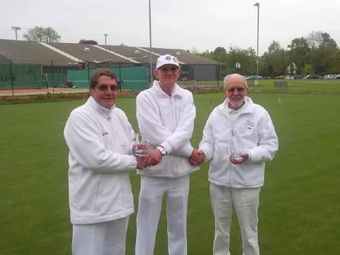 The team of Peter Ross (captain), David Tutt and Keith Rhodes, again with Nick Archer, played a match of two singles and one doubles game against each of the other five teams, and won all five matches. Bedfordshire, Essex and Sussex failed to make the cut to the Gold Medal round, where each of the three teams won one game. 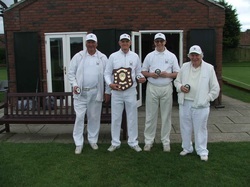 Hertfordshire therefore retained their earlier lead, and triumphed to retain the shield. The EACF team (playing in lieu of Cambridgeshire) was second, and Norfolk third.